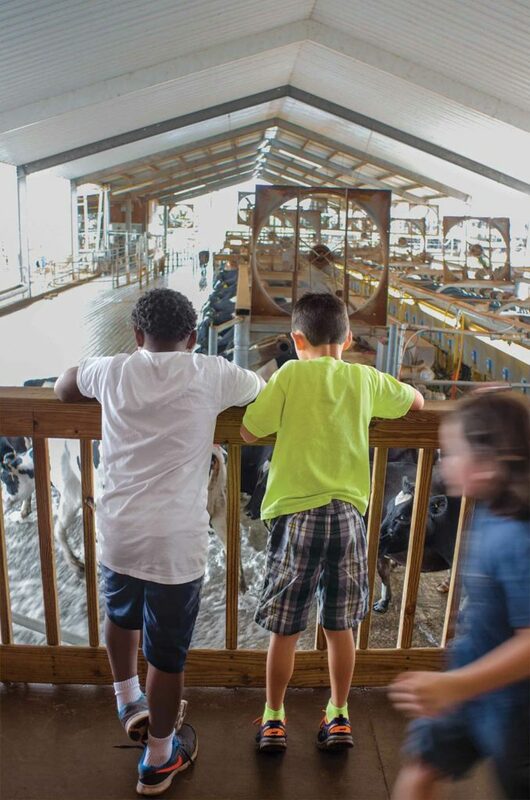 During Florida’s busy season, Dakin Dairy Farm’s parking lot fills with school buses as well as carloads of tourists and locals eager to see how a modern dairy farm operates. The Dakins not only milk cows, they also bottle and ship the milk, giving visitors an idea of what the business is about. Many of these visitors may be impressed by the experience but still not understand the grit and work it took to make this Myakka City, Florida, farm a success. Jerry Dakin left his family farm in 1997 and started with 250 dairy cows. He and his wife, Karen, moved to their current property in 2002. Since then, they’ve increased cow numbers ten-fold; employee numbers rose from six to more than 80. This happened as the state’s dairy industry, mirroring national trends, saw declining farm numbers. USDA census records show that in 1997, Florida had 579 dairy farms. Now it has 127, according to the Florida Department of Agriculture and Consumer Services. Along the way, the Dakins built and paid for an on-farm milk bottling plant and now ship several truckloads of product weekly. It took more than luck to make it work, they say. They did a lot of groundwork to hold costs down and to learn about the latest dairy technology. “Jerry is a researcher at heart. He has a unique brain. He will fly all over this country to learn how to do stuff,” Karen says. Cut costs. “I watched bottling plants go up at astronomical costs. Then four years later, they’re auctioning them off. We found the place that sells the seconds, the cheaper stuff that’s just as good. Things like that make us different. We would never have made it if we’d incurred a huge amount of debt,” Jerry says. Hello, world. Their plan included agritourism, as well. “People are connecting themselves with their food. Farmers need to tell their story. Now, a lot of people know our story. We say, learn to tell your own story. Don’t let somebody else tell it. Whole Foods taught us that more than anything. Tell your story or someone else is going to. If we don’t do these tours, we might be able to be out there doing more farming, but this is important for us and the dairy industry,” Karen says. Cally LaJeunesse in the farm’s petting zoo with Luna the baby goat. On school field trips, a tour guide explains the farm’s grass-fed program for cows, taking groups to pastures, the milking parlor, and the bottling room, where they learn about things like pasteurization and butterfat content. Going on a guided farm tour costs $15. A hayride costs $9, and winding through the fall corn maze, $12. There’s also an on-farm cafe serving sandwiches and snacks, and a store selling a range of farm-related items. “We want this to be a good experience for visitors, and we want it to reflect well on the industry as well as our own farm,” Karen says. In 1980, Manatee County, Florida, had 29 dairies. Now there are three. The other two are owned by Jerry’s brothers, Cameron and Farren. Their parents, Pete and Jeanette Dakin, moved here from Livermore, Maine, in 1963, getting into the dairy business in 1974. “The county has 26 fewer dairy farms than in 1980, but the three of us left have more cows and more production,” Cameron says. Those dairy industry dynamics make it even more important to reach out to consumers. Being located a few miles east of Bradenton in a growing population center gives them good marketing opportunities but also close proximity to neighboring subdivisions. That increases the agritourism’s importance. “When the kids leave this farm, they know a lot more about where milk comes from than their moms and dads do,” says Farren, Jerry’s oldest brother, who farms nearby. Plus, it fits into today’s move toward local food. “We don’t see ‘local food’ as a niche or a fad. It’s for real. People want to know where food comes from and who the farmers are and what the farmers are doing,” Karen says. A challenging spot. The hot, humid climate makes dairy farming in the Sunshine State tough. Many forages struggle here. Yet, the state is milk-deficit, and with 20 million residents and many more tourists, it needs more milk, not less. Florida does have good herds, thanks to generally high-quality facilities. Dairy farming here differs quite a bit from, say, Wisconsin or Minnesota, where cooler temperatures prevail and make production of many forages like alfalfa much simpler. “On its best day, Florida can’t compete with the Midwest on alfalfa. Floridians needs to work with what they can grow, and that’s grass. Dairies like the Dakins have a perennial grass diet, like hybrid bermudagrass. For nine or 10 months it can be cut every 30 days. Florida producers can also feed a lot more byproducts than in Wisconsin, things like citrus pulp. In Wisconsin, cows get 60% to 70% dry matter. Here, it’s roughly 40% dry matter. They feed a lot less forage here simply because they don’t have it to feed,” Lundquist says. Even with its challenges, the Dakins plant 1,200 acres of corn, half of it green chopped for feed. Grass remains the farm’s go-to feed, though, mostly ryegrass and bermudagrass. “What’s this farm’s secret? Grass. High-quality, good grass for the cows,” Karen says. The grass, fertilized by composted manure, gets mixed with grains, minerals, and hay in a formula prescribed by Rick Lundquist. “They get what amounts to a well-balanced, delicious salad. It gives them the vitamins and minerals they need to produce high-quality milk. The grass gets chopped twice daily, which helps avoid pest problems. Cow health is our top concern, and fresh grass helps us make sure cows stay healthy,” Karen says. Children from a school tour group watch water flush a freestall barn at Dakin Dairy Farm. Wander around the farm on a typical day during the busy season and you will encounter school groups learning about the farm. 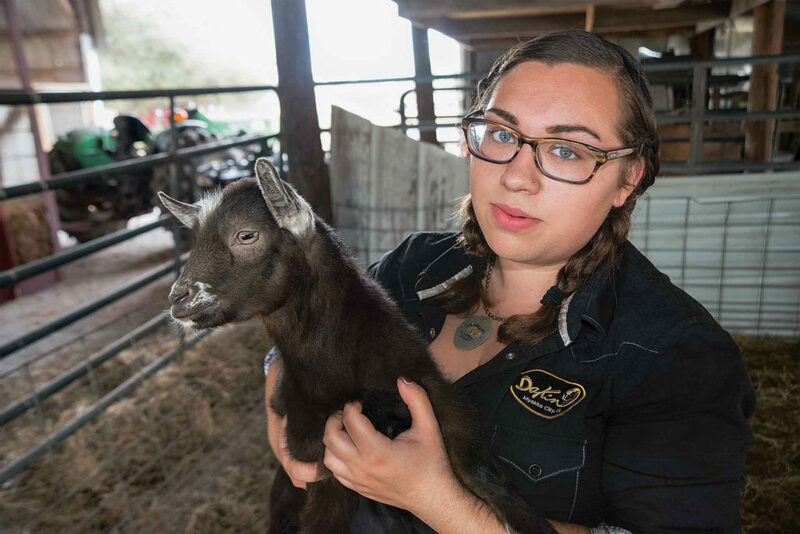 You’ll likely see young families at the farm’s petting zoo next door. There, children can feed small animals like goats and sheep, look at rabbits, and laugh at pig races. Some folks will be sitting at picnic tables, enjoying a Florida afternoon while eating sandwiches from the cafe and drinking milk, of course. 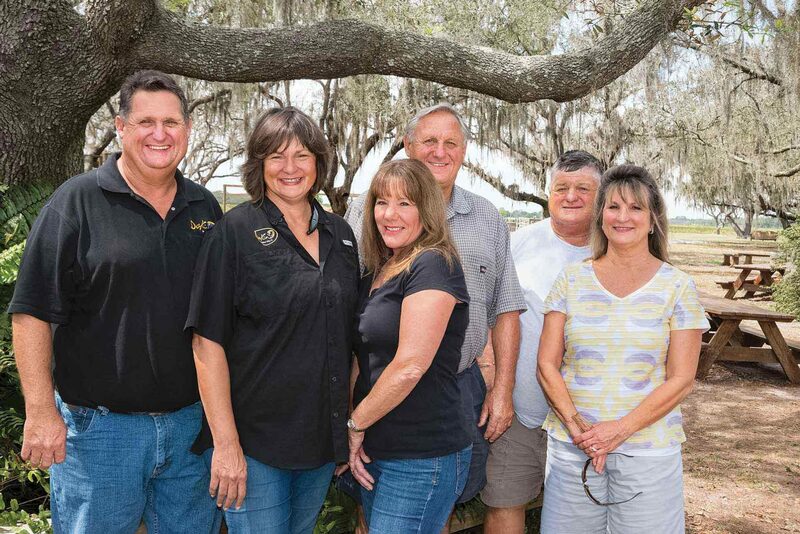 “One thing we hope people come away understanding is that this is a real family farm right here in Manatee County, Florida, in the midst of all this growing population. We’re local. We’re not playing tricks with it. We don’t emphasize that enough. We’re fresh from Florida. If you live in Bradenton or Sarasota, we’re right down the road,” she says. Even though they now employ quite a few people, Jerry and Karen remain hands-on, busy with each day’s farm activities. “We’ve done this through prayer and patience. Some of it was absolute dumb luck,” Karen says. “What we’ve learned is that if God gives you an idea, if you have this epiphany moment with a great idea that just sticks with you, you have to work to make it happen. Good things don’t just happen on their own. You put a foot forward, then another foot, and another one, and you keep moving,” she says. Opportunities. Ask Jerry about it and he says he just wants to keep the business moving forward. “Now there’s so much opportunity in the trends out there for people who can see it. Opportunities are everywhere. We just want to get better organized so we can take full advantage of them. We want this business to be good for us and for this community. We want to make smart moves,” he says. This North Carolina crop produces valuable compounds for the fragrance industry. A plant and animal enthusiast found the best of both worlds in gourmet mushroom production.